Hello Lovelies… Happy Monday! Are we in the Christmas spirit yet or what?! We finally headed out and went shopping yesterday. The mall was packed, lines in all the stores but definitely holiday spirit oozing everywhere. I just love this time of year! I love the sounds of Christmas music, Starbucks red holiday cups, the North Pole snow globe with Santa in it at the mall and SHOPPING. Seriously any excuse to buy things for other people makes me just as happy as opening my own gifts Christmas morning. 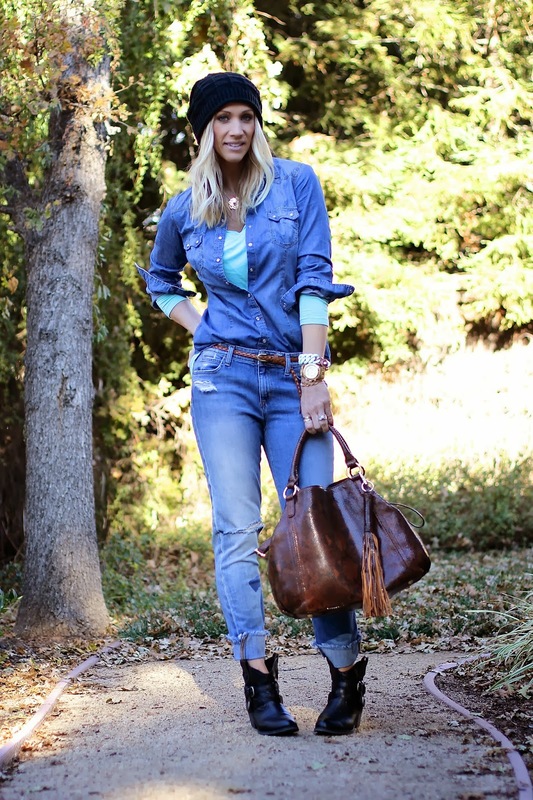 Denim on denim is still a favorite, causal outfit of mine. 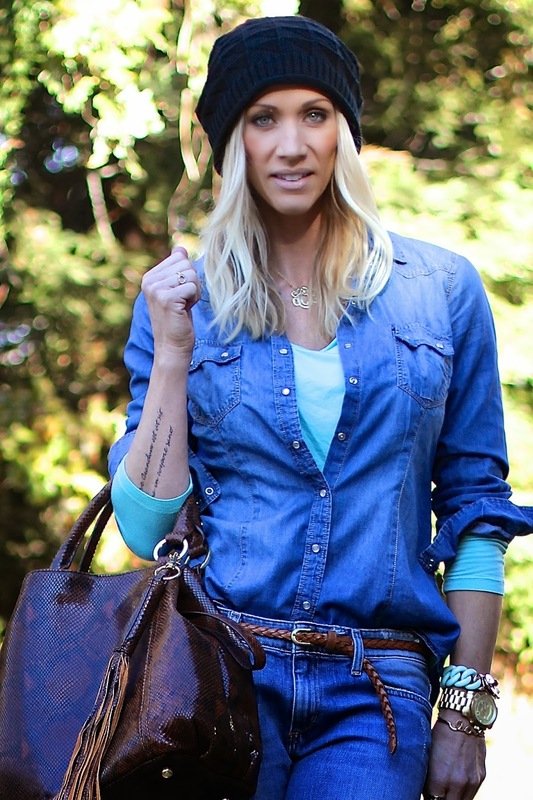 Now that our weather has cooled off a little, I can start layering under my Chambray and adding the beanie for warmth. Yes, still loving and obsessed with booties as they are comfortable and chic. Make sure to snag a pair if you do not already have some as they are also a versatile option of footwear as I wear them with skirts and dresses all the time too. Plus, if you are wearing booties then your toes stay warm! I have to mention this handbag. My sweet friend gave this to me the other day. I have been in love with it ever since and haven't swapped it out. It is the perfect size, has a shoulder/cross body strap, can cinch up tighter or look like a large tote and is such a gorgeous print that really pops next to your outfit! 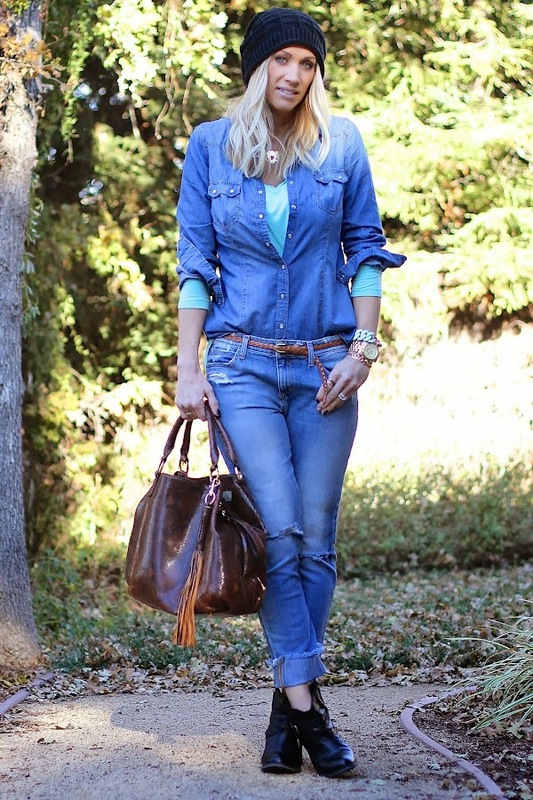 And can I just say obsessed with the fringe tassel… Ahhhh heaven! Thanks C!!!! I love it!!! How was the weekend? Any holiday parties? Shopping? I would love to hear!! Click HERE to see if you won any of the 12 Days of Christmas Giveaways!